Chinese green onion (Congbai)-Allium fistulosum L.
Common Name: Allium bulb, Wild scallion, Chinese green onion. Part Used & Method for Pharmaceutical Preparations: The fresh, white bulb is gathered in any season. 1. Initial stage of wind-cold exterior syndrome (the very early stage of common cold). Chinese green onion (Congbai) is used with Fresh ginger (Shengjiang) and Prepared soybean (Douchi). 2. Abdominal pain due to stagnation of qi by cold, or retention of urine due to dysfunction of qi of the urinary bladder. 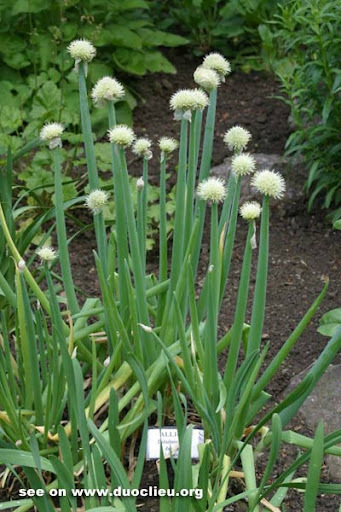 The heated Chinese green onion (Congbai) is used for external application on the umbilicus. 3. Boils, carbuncles, ulceration and skin disease. The mashed Chinese green onion (Congbai) can be mixed with honey and applied to the affected area. Cautions & Contraindications: This herb should not be taken with honey.